Cabbage and potatoes - we eat them almost daily and rightly so, it is always useful to have something that is grown close to home, in a familiar climate and was part of the diet even your distant ancestors. In addition, these vegetables can be very tasty to prepare. 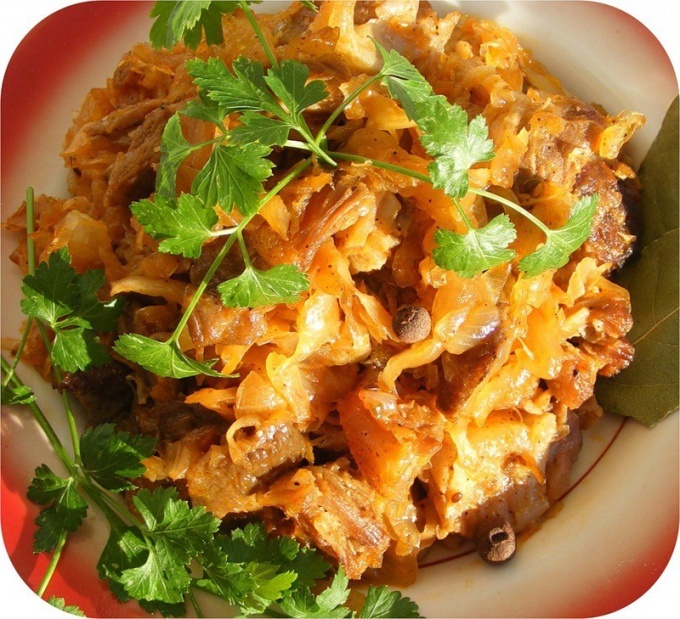 Wash and finely shred the cabbage, peel the carrots, wash and grate on a coarse grater, mushrooms, wash and cut into thin slices, peel the potatoes, wash and cut into cubes. Clean fat, remove the skin and finely chop, place it on the pan and fry, then put in a container to extinguish. Wash the tomatoes and cut into cubes, in a pan pour a little vegetable oil and place the tomatoes, saute for 3-5 minutes, stirring constantly, put in a pan shredded cabbage, stir, sauté and transfer to a roasting pan. Pour into the pan vegetable oil, fry the carrots, place in a roasting pan, then put the sliced potatoes. Fry the mushrooms and also send them in a roasting pan. Pour into the pan about a Cup of water, add chopped garlic, Bay leaf, pepper, salt and one teaspoon of sugar, stir and bring to a simmer, covering the pan with a lid. Simmer for about 20 minutes, the finished dish sprinkle with chopped greens of dill and parsley. Peel and wash the onions, potatoes, carrots. Potatoes cut into slices, grate the carrots on a coarse grater, finely chop the onions. Finely shred the cabbage, place it in a roasting pan with a small amount of sunflower oil. Put the roasting pan on a high heat and fry until the sprouts are brown. Add the tomato sauce, diluted with water, add the potatoes. Mix thoroughly, pepper, salt and continue to simmer for about ten minutes. Saute carrots and onions in a skillet until Golden brown, put the cabbage and potatoes. Add to the mix Bay leaf, black pepper and crushed garlic. Stew for ten minutes, until the potatoes are done, add the chopped dill and let stand about five minutes.